Motovated have an outstanding record in developing innovative ideas into successful designs. We have had the privilege to work on a lot of fun ideas that people have come up with, which tend to fall more into the consumer design category. The same design principles still apply though… it has to be cost-effective to make, it has to work as intended and it has to look good! If you have a novel idea but aren’t sure how to get it into the market, then we can help you with everything from your patent application drawings, conceptual design through to a fully engineered product and manufacturing drawings. We have a proven track record of turning people’s smart ideas into successful working products. We can take a simple sketch and work through the design process closely with you to produce detailed manufacturing drawings and help with the initial stages of manufacture. We can predict the behaviour of your products before you have even made one. Using advanced computational tools we can virtually prototype your design as it is being developed. Using the latest 3D Computer Aided Design we can provide you with detailed manufacturing drawings that can be taken anywhere in the world for manufacture. Exploded views are an excellent way of showing a design concept for use in patent applications. Because we have been there before we can offer guidance on the best options to further develop your product. We are able to take the 3D models created and produce photorealistic images and exploded assemblies to use in pre-market marketing and production of manuals. The Gyro Board was Graeme's brilliant idea for a board sport cross trainer and extreme adrenaline activity. We took the idea from a real prototype to a full set of Engineering drawings ready for mass production, including analysis to ensure that the parts were strong enough. Motovated have been working in conjunction with FX Bikes to produce a super light motorcycle. 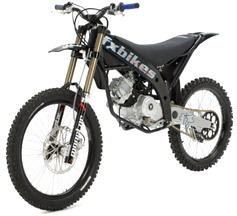 The concept is essentially a cross between a motocross bike and a mountain bike.